In this review, I will be discussing the Gentle Cleaner, Firming Eye Cream and Nourishing Moisturizer. 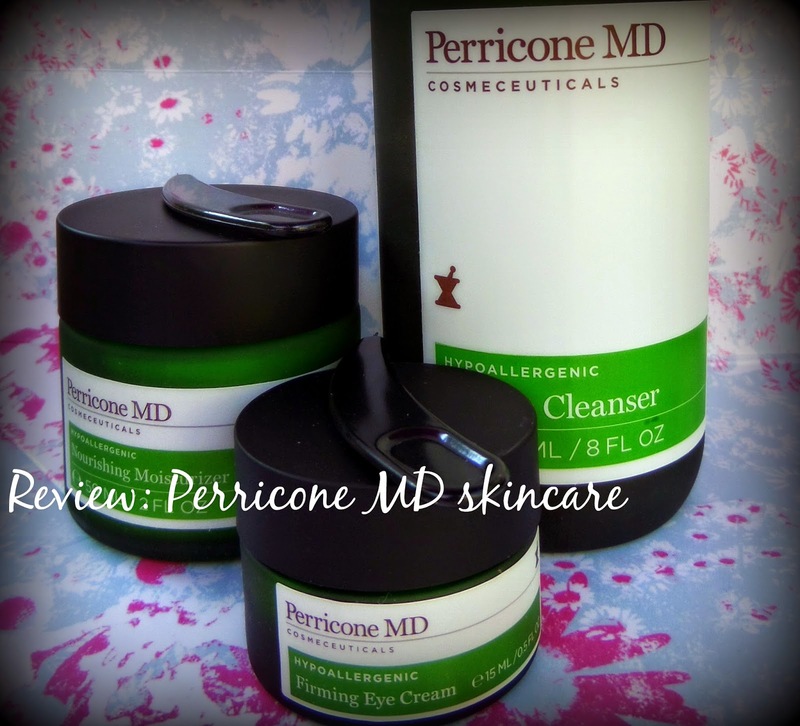 The Perricone MD Gentle Cleanser is a mild face wash without the detergents that sensitive skin is normally allergic too (you know the ones, that make your face feel really tight and hot after washing). Firstly, the packaging. This cleaner comes in a beautiful glass bottle with pump lid. The cleaner has no special smell, but looks and smells a little like olive oil. This is probably because it's made from olive polyphenols and gently removes makeup and dirt. The product applies nicely and is quite unusual in the gel-consistency. You dampen your face, then massage the gel in. As you add water and massage, the gel turns cloudy white but doesn't foam in the traditional sense. Then wash it off thoroughly and unveil clear skin without redness. It doesn't contain any parabens or nasties to be allergic to. I know it's really challenging for people who have sensitive skin to swap and use something new so I was very scared when I tried this but I haven't had any reaction and have noticed my skin is makeup free and feels nourished after washing. Again the moisturizer comes in a glass container, but this time it's a jar. I'm not normally ok with jars as I don't like dipping my fingers in to products as it could spread bacteria, but this comes with a little spatula allowing you to scoop the right amount out. The product goes a long way, I need a tiny pea size to cover my whole face and neck. The product itself is very thick and rich which initially put me off as I have oily skin already. I applied it the first time and freaked out at how shiny my skin looked, but after a couple of minutes it had sunk in really well and I had dewy, glowing skin. It was a big step away from my normal oil-minimising moisturizers which mattify, but after reading how much Caroline Hirons dislikes them and that they actually cause drying and distressed skin, I thought I would give it a chance. This product didn't get me as excited as the others. I don't seem to struggle with sensitivity around the eyes though and can use any old eye cream so that might bias me. This cream feels very similar to the moisturizer but in a smaller jar. It again has a little spatula to scoop with and a tiny bit goes a huge way. In my opinion, for the price of £53, this is not a product I would buy.